There are so many brad nailers in the market which is a good thing right! It might turn out to be a very difficult job to find the best brad nailer from so many options available. Luckily few power tool manufacture brand actually make a great product. Today we got the opportunity to check out PORTER-CABLE BN200C 2-Inch 18GA Pneumatic Brad Nailer Kit. 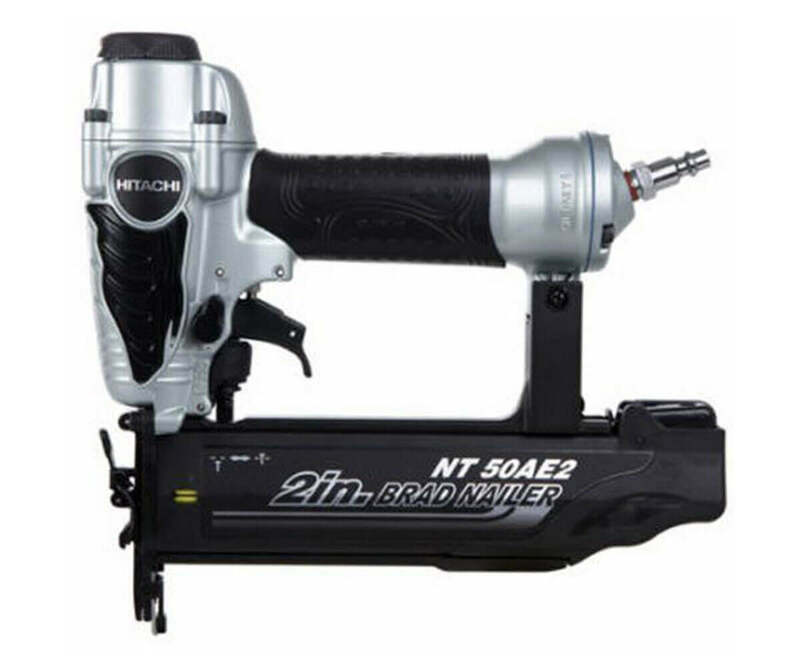 This is the newer version of BN200 series nailer. PORTER-CABLE designed and manufactured BN200C to fire 18-Gauge fasteners with the max length of 2 in. , that is capable for handling an array of various fastening job with this easy to use pneumatic brad nailing kit. PORTER-CABLE BN200C is highly recommended by professionals for its ability to meet expectation from heavy duty jobs in a large project with frequent use. The internal piston of BN200C generates enough power to drive standard 18 gauge brad nails with consistency in every shot. This air tool has the capacity to do all kind of brad nailing task that is not limited to small home repair jobs, picture frame or kitchen crown installation. 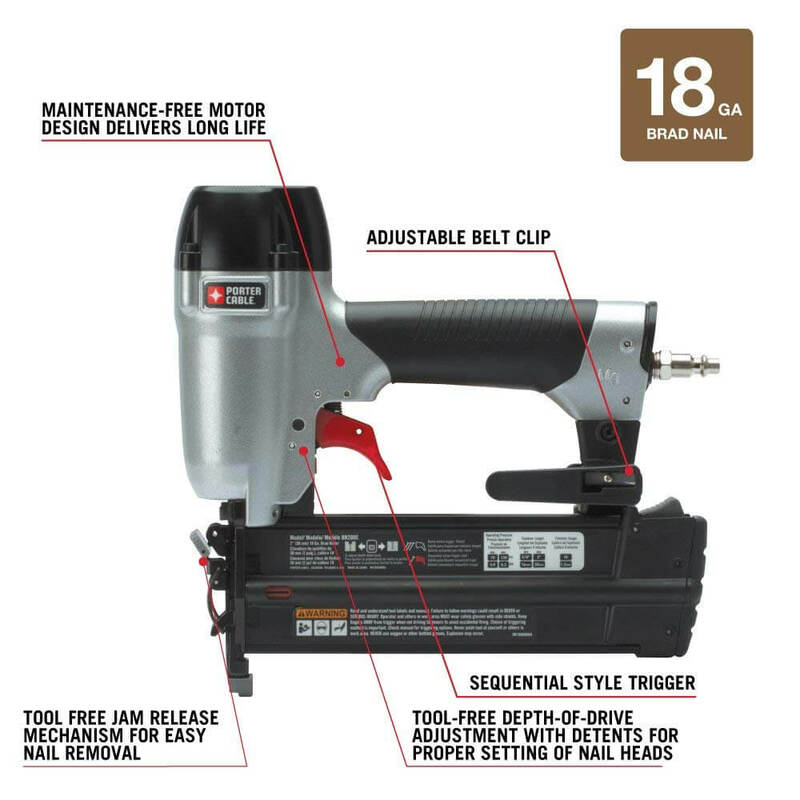 A suitable brad nailer for professional contractor and DIY alike. Before deciding what brad nailer you want to buy, find out more about the latest development and new feature PORTER-CABLE added in BN200C from our review. We like to confess one thing for full disclosure and our commitment to be honest with our reviews. 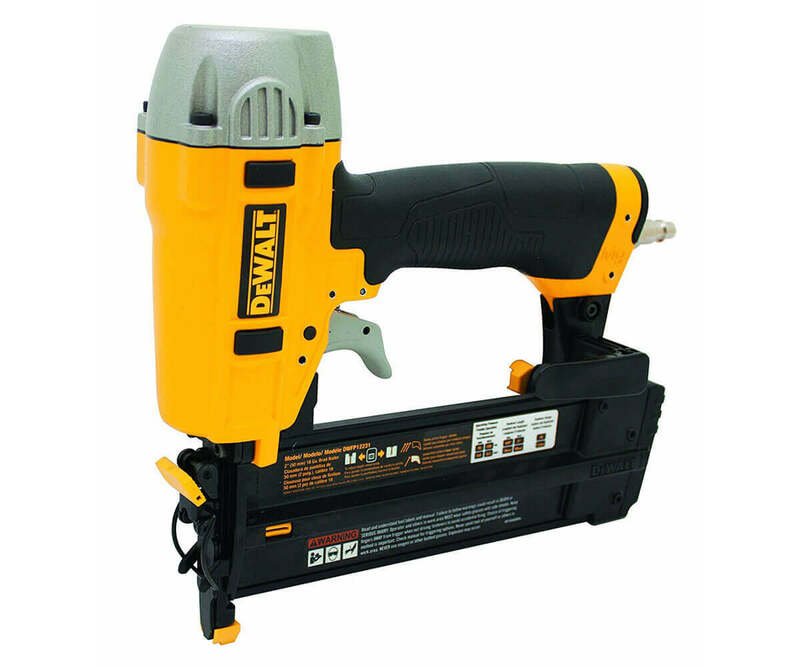 Here is the thing we are bit more favorable to one that offers nailer with hard casing than the one with bare tool. In first look, we liked the rugged casing that comes with BN200C. Plastic molded casing more look like storage for military grade hardware and inside it you will find the PORTER-CABLE BN200C 18GA Pneumatic Brad Nailer, 1/4 in. Male Quick Plug with Dust Cover, 500-1-1/4″ Brad Nails and 500-1″ Nails, 2 Standard No-Mar Tips, Belt Hook, Oil, and Operating Manual. Included accessories can vary depending on location and offer available at that time, and please check before buying. The nailer design suggests PORTER-CABLE made the tool for rough use for your construction need and surprisingly lightweight derived from magnesium body will make it durable. Tool dimension and ergonomic design suggest it will be easy to handle even if you lack of previous experience with the brad nailer. It is the perfect combination of power to drive maximum brad nailer into hardwood and get fine finish carpentry and woodworking. Porter Cable made it possible with an internal piston that provides power and consistency through every shot. Long life maintenance-free motor also keep work area from straining. All these parts are housed safely inside the magnesium body of the nailer giving stability and longer use. However, oil-lube is required to keep the pneumatic brad nailer working properly. 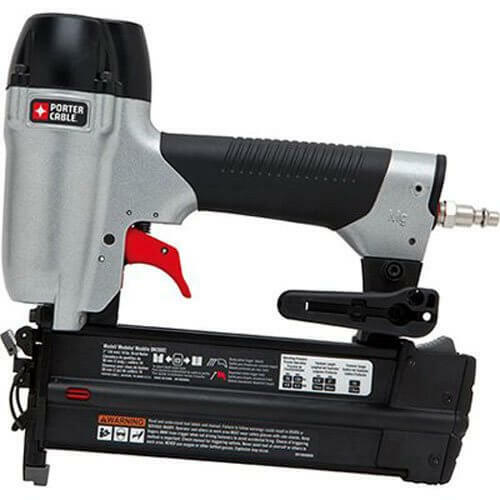 PORTER-CABLE BN200C is precisely built for sinking standard 18GA brad nails from 5/8″ to 2″ length commonly used in all kind of carpentry and woodworking job involving a brad nailer. Straight angled magazine with sideloading design can hold upto 100 adhesive collated fasteners. We found BN200C is very easy to reload by simply flipping the magazine lock, load from the side and lock it back without ant tool. It is also equipped with a low nail indicator. Porter Cable added Sequential style trigger for safe nailing and tool-free depth of drive adjustment for easy selection of depth of sinking nail. Open nose design gives the user a tool-free quick jam release function that improves nailing experience. Other useful designs that help tool performance are removable non-marring nose to protect against marring the work surface, rear exhaust keep contaminates away from work and trigger lock-off switch prevent unintentional firing. With all these features PORTER-CABLE BN200C is slated for all kind of brad nailing job. PORTER-CABLE’s excellence in tool making is not limited to performance only, the design of BN200C also indicate, they spend a significant amount of time for user comfort and convenience. Holding the integrated rubber grip handle for the first time really feel comfortable and easy control of the tool. Another thing we noticed is a reload fastener indicator on side of the magazine that notifies the user about the low nail. Adjustable belt clip help user to carry the nailer while not in use. Intelligent placement of contact safety behind driver guide gives better visibility to the user. Lastly, onboard tool storage has space to keep the extra non-marring tip. It’s the most tricky part of any product review, how to measure product value against the price you pay to have it. In most cases, people are happy to buy the premium priced product from the brand that is perceived to be high value and high in quality and vice versa. Buying power tool only for its brand value or face value is not a great idea. We like to consider all the aspect of the product to find its true value. In terms of value proposition, Porter Cable BN200C is a reasonable priced pneumatic brad nailer. The overall value of the package outweighs its price. You might consider buying it for numbers of reasons. Three year limited warranty, rugged carrying case that is full of accessories, its proven performance with hardwood, user friendly design and Porter-Cable brand itself. Magnesium body for durability and lightweight at 2.375 lbs. Power to drive maximum fasteners into hardwood with internal piston catch that provides consistent maximum power on every shot. Removable non-marring nose tip prevents damaging work surface. Reload indicator and adjustable belt clip. The oil-free operation is not available. Oiling requires for regular use. Porter Cable is not new in power tool industry and offers all kind of power tool sold in online and hardware store near you. Whatever product we review, we try to collect customer feedback to compare our findings. Though it is not so popular as Hitachi or Bostitch, it do have a solid user base. Data collected from online sources indicate 70% to 80% user rated 4.5 out of 5 and bottom level rating among its user is hovering around 7%. Our own scoring system rated 8.32 out of 10 for overall score. We measured all the aspect of PORTER-CABLE BN200C in terms of Features, Design, Quality, Performance, Usability, Ease of Use and Value for Money to overall score. 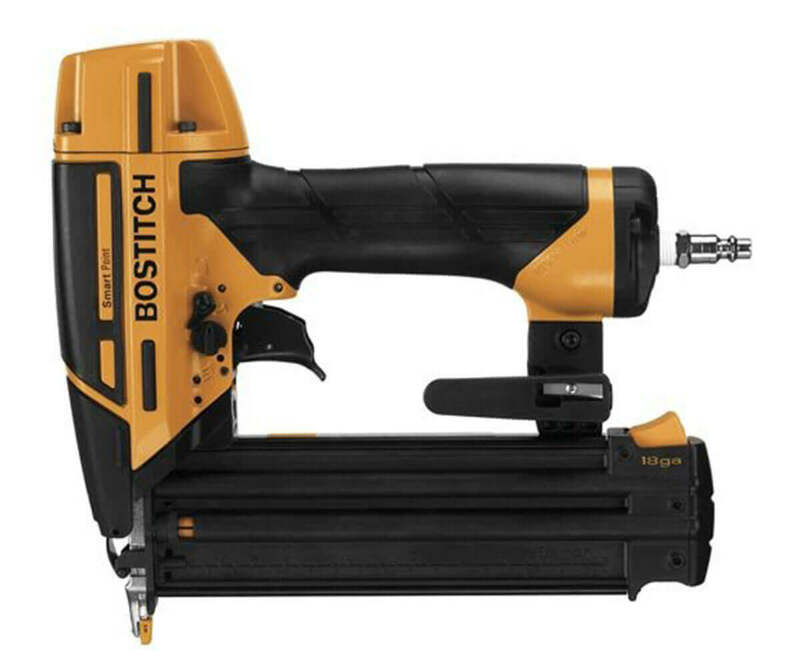 In short PORTER-CABLE BN200C is an ideal 18GA Brad Nailer for perfect finish carpentry and woodworking. Its application in large scale commercial project can be treated as the certificate of reliability in all kind of brad nailing task. 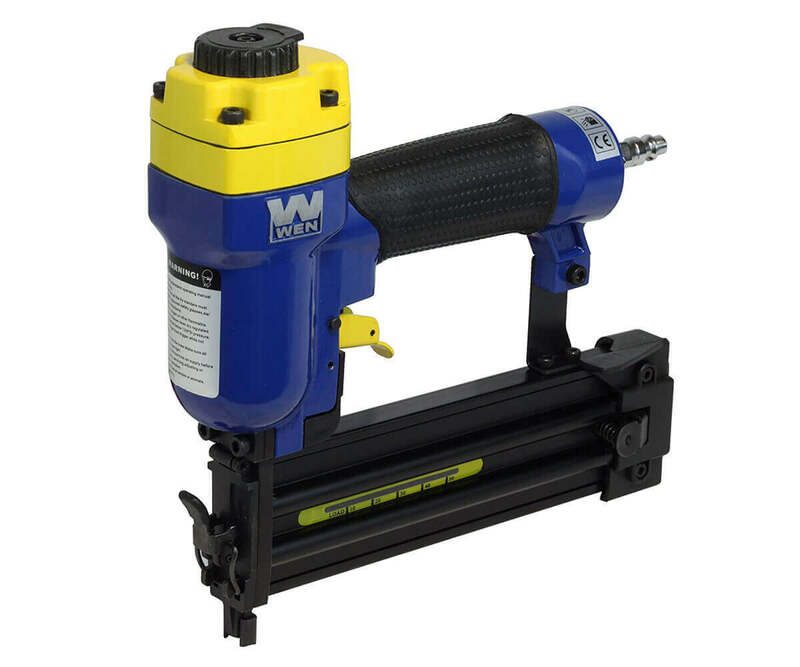 BN200C design delivers optimal performance with its durable, lightweight, low maintenance and remarkable features that differentiate it from other air powered brad nailer. With few minor drawbacks, it can be your choice for best pneumatic brad nailer if you consider low price and great value you get from it.